Potatoes grown in Da Lat, the capital of the Central Highlands province of Lam Dong, will now carry anti-counterfeit stamps before distribution, as part of a pilot plan to distinguish them from Chinese produce sold under the guise of originating from Vietnam’s greens hub. The initiative officially began on Monday, involving 1,500 metric tons of potatoes sourced from nine producers in Da Lat, according to Lai The Hung, head of the Lam Dong Plant Protection Department. These potato suppliers have been provided with 65,600 special cartons for packaging, which are embossed with the logo of the Da Lat produce brand. Inside each of these cardboard boxes are special plastic bags of 0.5kg and 1kg, each of which is placed with an anti-counterfeit stamp and a trademark logo saying they are authentic Da Lat potatoes. Traders are supposed to put their potatoes in these bags and cartons before the produce leaves Da Lat. 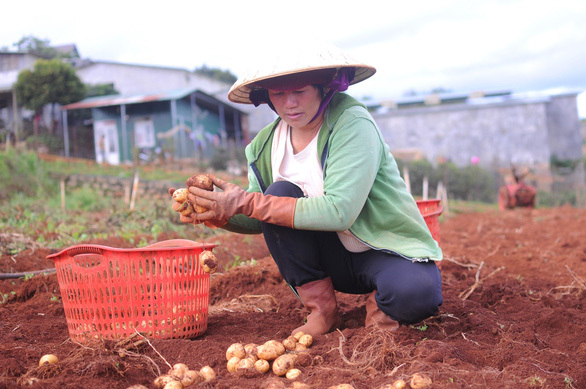 In the immediate term, the initiative is only applicable to potatoes and will soon expand to other products grown and harvested in Da Lat, according to the plant protection department. “Businesses, cooperatives, and household plantations who wish to get the anti-counterfeit stamps and special packaging will have to register with the plant protection department,” Hung said. In September 2018, Lam Dong authorities began to bar non-local farm produce from the Da Lat Agricultural Produce Market, following several high-profile cases in which non-local products, especially those imported from China, were found having their origin ‘washed’ at the market before being distributed to other localities across Vietnam as Da Lat delicacies. The Da Lat Agricultural Produce Market, some ten kilometers east of the touristy city’s downtown area, functions as a local agro-business market, where vendors must commit to trade only produce of Da Lat origin, according to Da Lat's deputy chairman Nguyen Van Son. But for many years, local traders have employed a tactic to fool customers into believing the non-local farm produce they buy is from Da Lat. The dishonest traders would source a large number of green products to the market before using some kinds of machines to wash and soak them in the red basaltic soil typical of the Central Highlands region. Customers tend to believe that potatoes and other produce covered in red dirt are really Da Lat-grown, thus falling into the trap of the fraudulent sellers.